It's easy to imagine Nintendo Switch sliding into a virtual reality headset accessory - just like a Samsung Gear VR but with a dedicated gaming system instead of a phone. 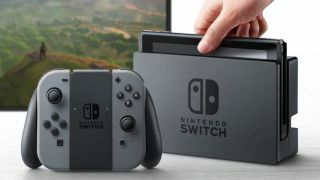 Nintendo says it won't give any more firm answers about Switch until its debut event on January 13, but company president Tatsumi Kimishima left the door to VR open in a translated interview with Bloomberg. "If you asked as if [Switch having VR capabilities] might be possible in the future, certainly we can't say no," Kimishima said. "In terms of how it can be used for gaming, it's something we must consider. It depends on the system specifications. I can't say that we have no interest in VR because VR offers new ways of playing, but that depends on what kind of software can be played. But what kind of software works, that's only something you only know once you actually experience it. And our games are ones that are usually played for a long time." Nintendo already has "the core technology" for VR laid out, according to creative boss Shigeru Miyamoto, but it also has a lot of unanswered questions about its potential. I doubt Nintendo will even mention VR during the Switch debut event since the company's taking a more "wait and see" approach than much of its competition. To be fair, it already made a sort-of-virtual-reality system back in 1995 and that didn't really pan out. You're gone but not forgotten, Virtual Boy. Hopefully PlayStation VR and company turn out to be successful, Nintendo follows suit, and we can look forward to playing marathon sessions of Super Mario Reality on Nintendo Switch sometime in the next few years.